These pages were designed to help 5th graders explore concepts of motion and design. Students experiment with different forces to make a roller coaster operate. 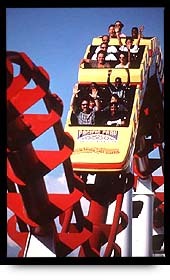 One extension of this is to design a coaster that stays on the track and completes the run in the least time. Students I have worked with have gotten it down to 28 seconds. Send comments to Pat Sine at sine@udel.edu.